The three pigeons arrived on Lyndon Street and strode down the right side lane in unison. There are many names for pigeons – flying rats, trash birds, dirty parrots. 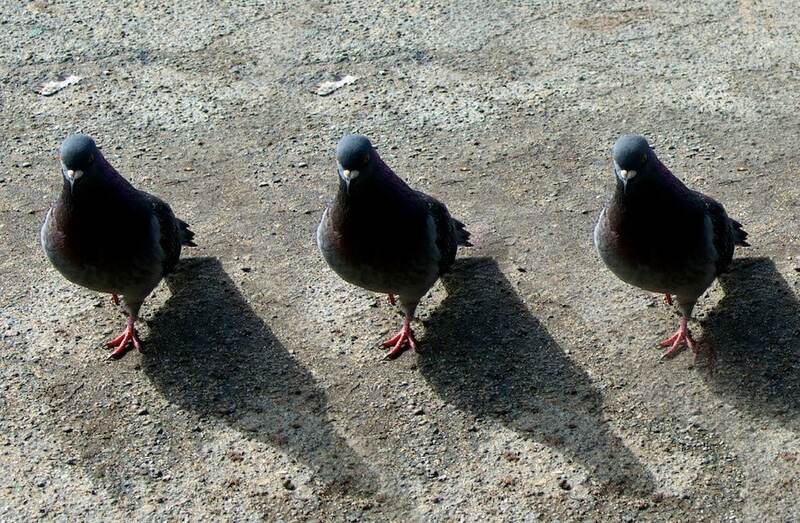 But no one called these three pigeons what they were: Harbingers of Doom. In fact, people didn’t call them anything at all. Everyone on Lyndon Street kept doing exactly what they were doing before the three birds began their strut. A baby might have noticed the three birds, but the gurgles and burps of babies are regularly untranslated and forgotten. Not even the baby’s attempt to point brought the Harbingers of Doom to the attention of any passerby. However, what the pigeons brought was noticed almost immediately, first by Susan Wells who sat down to get her hair cut for prom with giddy anticipation. She wanted to tell the woman to make her look like a “pretty pretty princess” but she held her tongue and instead explained the complicated processes that she desired, memorized from the pages of Seventeen. The pigeons’ first act was subtle, and directed only at Susan. She noticed when she shivered from the cold water being sprayed on her beyond-shoulder-length hair but thought it might be jitters, until the hairdresser’s comb fought a small kink in the luxury of Susan’s hair and tears welled up in her eyes. Susan’s hair was no longer dead, limp and lifeless, hanging off the back of her head the way clothes hang off the wearer. Her hair had come to life. The hairdresser was used to yelps, however, and went to grab the scissors to trim Susan’s split ends. Her first snip felt, to Susan, like someone had taken her left hand, put it in a guillotine, and chopped, severing just the first few inches of skin off her fingertips. Blood dripped down Susan’s back from the freshly cut hair and she sobbed into her hands while her hair briskly snatched the clippers from the woman and threw them across the room. Secondly, the pigeons’ directed their doom and destruction towards a muscle car parked poorly at the end of the street. The man who drove the car, Lionel Evans, came out of an ice cream shop licking an ice cream cone and found his way into the car, only to feel his seat writhe underneath him. Unnerved, Lionel looked behind him to see two cows form out of the seat leather, with a sound like two beach balls squishing against one another. The cows mooed angrily in the back seat, pushing the weight limit of the backseat to its breaking point and popping the back tires. Still, the pigeons strutted unnoticed, even though no cars went down the right lane of Lyndon Street. No one saw them walk by Lionel and his car and his four re-formed cows. Susan Wells’ cries could be heard even two blocks down as she tried to find a way to staunch the blood from her hair. The pigeons had one more trick up their beaks, but they made sure to be on the sidewalk before they attempted it. Every single bit of asphalt – be it refilled pothole or original blacktop – all the gravel, all the oil, all the quartz inserted manually to make the street shimmer on Summer days; all of it vibrated. At first, all hands of everyone on Lyndon Street went to see if cell phones were ringing, because that’s what it felt like at first – just a low, insistent vibration that tried to alert you that someone was trying to tell you something. Then every molecule of the street decided to go back from where it came from originally: a mixture of quarries, volcanoes and far-away stars. Lyndon Street dead ended where a freeway intersected it on one end, and stopped being Lyndon Street and became Petunia Avenue at the other. Its entire length of asphalt changed its gravitational pull from down to the earth’s core to wherever it came. The bits of street shot like rockets – through cars and traffic lights. They shot through some unlucky people’s feet. Susan and Lionel looked on and decided that their day was going to get worse and worse. Other people, like teenager Peter Doyle and grocer Orlando Rodriguez, had the fleeting feeling that they were witnessing a miracle, and nothing like this would ever happen in their lives again, and they had no idea how to describe it. Others didn’t notice anything wrong at all and stepped into the freshly vacated street, only to find rebar and dirt. The three pigeons – the Harbingers of Doom – stopped their march and looked back to see what people were saying to one another. They saw two women pull a third up to the sidewalk after she fell when she didn’t notice the street was gone. They saw a child feeding his sandwich to a cow that was being pulled out of Lionel’s muscle car. They saw a doctor who was passing by the barber shop scratch his head as he tried to bandage up suffering Susan’s head. They were a little peeved that they weren’t noticed, but realized that people have more important things to do with their lives than notice pigeons. Groups of friends grew larger while more people tried to make sense out of the things that had happened. Strangers pointed at all sorts of oddness on the street and made lifelong connections with each other. Now that the three bad things had happened on Lyndon Street, all the good could start happening again. The pigeons took flight and disappeared into the blue sky. Posted on Wednesday July 28th, 2010 Wednesday March 26th, 2014 by Max Elman. This entry was posted in Photos & Stories and tagged birds, clones. Bookmark the permalink. Maybe they are agents of change? Why was there any dirt left? ?